With April being a cold month in Toronto so far, it is hard to feel too concerned about global warming. But it is worth noting that the greenhouse effect can cause weather extremes in both directions. 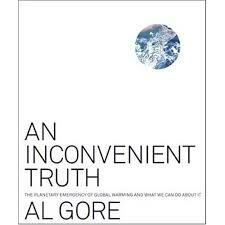 Al Gore’s An Inconvenient Truth won an Oscar for best documentary in 2006. The clear message in this ground-breaking movie is that governments, industry and people must cut down on fossil fuel use, and soon. We can also play a powerful role for positive change by adjusting what we eat. Global climate change is directly related to agriculture through the loss of wilderness to farmland, methane released from animals, and energy-intensive fertilizers, pesticides, food processing and transportation. By eating low on the food chain, locally-grown and organic, you can make a significant difference. Why didn’t Gore mention anything about agriculture in the movie? Likely Gore wanted to keep the message focused, and targeted to the political situation in the U.S.
Americans consume almost a quarter of all the beef produced in the world. Aside from health issues associated with eating lots of meat, a high-meat diet translates into a tremendous amount of carbon emissions. It takes far more fossil-fuel energy to produce and transport meat than to deliver equivalent amounts of protein from plant sources. When the movie was made, the role of diet may not have been as well known as it is now. An important report released in Nov. 2006 by the United Nations Food & Agriculture Organization shows that livestock production is responsible for an incredible 18 percent of human induced greenhouse gas emissions worldwide – more than all of the world’s motor vehicles. Agriculture emits carbon dioxide through transportation, fertilizer production and the energy used for factory farming. Deforestation (partly to clear land for agriculture) is responsible for 13% of climate change through the release of stored carbon dioxide. Methane causes 17.3% of climate change due to livestock digestion, animal manure, rice paddies, dams, fossil fuel extraction, and landfills. Nitrous Oxide (N2O) accounts for 5.4% mostly due to fertilizers. At least 13% of climate change is due to cutting down or burning forests. A lot of forest is cleared for agriculture, especially in rainforest regions. The photo to the right is a satellite image of the Brazilian State of Rondonia. Intact wilderness is dark green. Farms and recently deforested areas are lighter colours. Satellite data shows that 600 fires were started each day on average during 2004 to clear land for farming. The rate of destruction has doubled in the last decade. Rainforests are home to one third of land species. About 39% of climate change is due to using oil, natural gas and other fuels. Some of this energy is used for the processing, packaging, refrigeration, and transportation of food, factory farms, and the production of fertilizers and pesticides. A 2002 Worldwatch report says that a typical meal made with ingredients from a supermarket takes four to 17 times more petroleum consumption in transport than the same meal made from local ingredients. And a head of lettuce grown in California and shipped nearly 3,000 miles to Washington, D.C., requires about 36 times as much fossil fuel energy in transport as it provides in food energy when it arrives. In terms of production, animal foods demand a lot more energy than plant foods. According to one study, meat production requires 10 to 20 times more energy per edible tonne than grain production. Growing feed crops requires extensive energy for ploughing, harvesting, pumping irrigation water, transportation, and producing fertilizer and pesticides. Once grown, the crops are dried and processed using additional energy. Furthermore, the housing of pigs and chickens in huge windowless sheds requires energy for artificial ventilation, conveyor belts and electric lighting. Slaughterhouses are also energy intensive. For harvesting fish, extensive energy and resources go into building, maintaining and fueling fleets of trawlers. The latest invention to slow global warming? Methane is responsible for 17.3% of climate change. The high percentage is due to the fact that methane is 23 times more potent than CO2. The good news is that its warming effect only lasts 10 years compared to 100 years for carbon dioxide. Scaling back methane emissions will lead to a quicker reduction in climate change due to the shorter lag time. Livestock digestion (i.e. burps and farts from cows and sheep) accounts for 18% of total global methane emissions, and factory farm waste lagoons account for a further 7% of emissions. Combined, these two sources equal 4.3% of total climate change. Other sources include dams (accounting for 20% of emissions), fossil fuel extraction (20%) and landfills (10%). Rice paddies account for around 10%, but rice is a staple food for a lot more people (half the world’s population) than cow meat is, and BBC reports that there are varieties of rice being developed that emit much less methane. Dams are often built to hold water for irrigating crops – especially feed crops such as corn and soy. In Alberta, most large rivers have been dammed for the main purpose of collecting water for irrigation. Nitrous Oxide (N2O) is a powerful greenhouse gas that accounts for 5.4% of climate change. It has one of the longest atmosphere lifetimes of the greenhouse gases, lasting for up to 150 years. Since the Industrial Revolution, the level of nitrous oxide in the atmosphere has increased by 16%. About 70% of human induced N20 emissions is due to the widespread use of nitrogen-based fertilizers. Tilling soil, transportation and industry make up much of the rest. In Canada and United States, farming practices amount to 8% of climate change due to the release of methane, CO2, and N2O. This figure doesn’t include deforestation when new farms are created. In the rest of the world, where there are fewer cars and industry, farming accounts for a much higher percentage of climate change. Tilling soil causes carbon dioxide to be released. There are roughly 44 tons of C02 in an acre of healthy soil. Tilling a field releases up to 4 tons of CO2 per acre. The United States has lost a third of the original topsoil since settlement. Every year, the planet’s soils absorb roughly 50 billion tonnes of carbon from decaying vegetation and release 50 billion tonnes through decomposition. But forest destruction and farming weakens the soil, causing 1.5 billion tonnes to be lost to the atmosphere. It is estimated that about 7% of CO2 in the atmosphere is from carbon that has been lost from soil. Photo: Healthy soil is full of life and capable of absorbing carbon dioxide. Moving toward a vegetarian diet is the most powerful food choice you can make to reduce climate change. A meat-based diet uses far more agricultural land than a vegetarian diet because domesticated animals must also be fed. Taking individual weights into account, food animals outweigh people in North America by a factor of four to one! All these animals need food, water and transportation. Most of our farmland is dedicated to feeding them. By curtailing our meat consumption we could free up millions of acres of agricultural land that could be returned to forest and wild prairie, absorbing tons of CO2 in the process. Using less farmland also means less soil erosion, less irrigation water, less pesticide, less N2O emissions, and less fossil fuel for farm machinery and fertilizer production. The United Nations Food & Agriculture Organization issued a stunning report on global warming in Nov. 2006. Livestock production is responsible for more climate change gasses than all the motor vehicles in the world. In total, it is responsible for 18 percent of human induced greenhouse gas emissions. It is also a major source of land and water degradation. A recent study at the University of Chicago, found that a vegan diet is the most efficient, saving a ton and a half of CO2 or equivalents per year when compared to a standard North American diet. By comparison, the average American car driver emits 1.9 to 4.7 tons of carbon dioxide, depending on the vehicle model and fuel efficiency. The study found that red meat and, surprisingly, fish were responsible for the highest emissions. Most seafood undergoes energy-intensive long-distance travel from ocean to market. Energy used for food production accounts for about 17 percent of all fossil fuel used in the United States. Furthermore, livestock production emits greenhouse gases not associated with fossil-fuel combustion, primarily methane and nitrous oxide. Buying locally grown food greatly reduces the energy and resources necessary to transport and store foods. Typically, produce from Mexico or California is shipped in refrigerated trucks. When you buy long-distance food part of the price you pay is for fuel and the truck. Fresh food from other continents is typically flown in by airplanes. Planes require staggering amounts of fuel to lift produce and meat into the air and across oceans. Buying organic foods supports farmers that are using alternatives to nitrogen-based and petroleum-based fertilizers. Organic farming methods also tend to be more gentle on the soil, helping to reduce soil erosion and CO2 emissions from soil. A 2004 study, from the University of Arizona, found that half of all food ready for harvest never gets eaten. The average family of four throws out $600 worth of good food every year. There is a huge opportunity to reduce this wastage by adjusting shopping, storage and eating habits. For example, eating leftovers is a great way to reduce the amount of garbage that ends up being trucked to landfill sites. Landfills emit methane, and food wastage requires more agricultural land. Look for foods that require little or no packaging, such as whole fruits, vegetables, and bulk dry goods. By eating vegetarian meals, you can avoid animal products that tend to require more energy for processing, packaging, and refrigeration than plant-based foods. See Minimizing wastage for simple ways to reduce waste. Posted April 15, 2007 by TVA. Filed under Resource Centre, Sustainability. Get the latest Vegetarian news and restaurants directly in your inbox. Become a member of the the TVA and get discounts on meatless meals and groceries with the Toronto Veg Card. You'll also get access to Toronto vegetarian news and events in our Lifelines newsletter. Support Toronto's go-to resource for all things veg. Inspiring people to choose a healthier, greener, more compassionate lifestyle through plant-based eating.